I confirmed the 2 pm rendezvous at 826 S Berendo and paid the bill. It was 1.30. Mailing Dan Fante the digitized copy of his cousin’s documentary on his dad would have to wait till Monday. I dropped Kim off at the Broadway Viaduct and got over just in time. 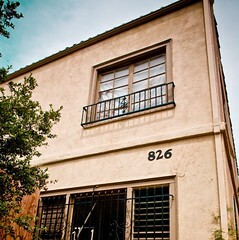 826 South Berendo is a duplex apartment complex built in the early 1920s on the southern edge of Koreatown. 4 units in the main structure, and two up over the garage in back. It is surrounded by modern luxury apartment complexes on all sides. The building has been abandoned for some time, the demolition permit was filed 18 months ago. It is fenced, and the windows and doors boarded. In 1939 John Fante, recently married to his young wife, Joyce, moved in and in a period of a few weeks wrote Ask The Dust. They lived in 826, one of the front units. After a while they moved away, and then at some point in the next two years, they moved back again, this time into one of the garage units. Fante had spent the time away from Berendo racked with writer’s block, and hoped a return to the building would inspire him. Meeno and I climbed through the fence, and found the doors to one of the garage units open, as well as the one to 826. I have spent my share of time in abandoned structures like this, makeshift drug dens, squatter’s lairs, but this was still hard to stomach. The ole’ boy is still there, listening to the hard luck stories, consoling them as their pipe dreams slip back into the bitter light of day, looking after the feral cats, wondering why it took us so long to find him. Stay tuned. The campaign for an historical marker has just begun. It should not be lost on anyone with a sense of irony that just a bit further north, this same street, Berendo, has been renamed for another notable L.A. author, L. Ron Hubbard.